Brass City Charter School depends on the generosity of foundations, corporations, public agencies, and individuals to realize its mission of providing our students a rigorous, well-rounded and emotionally supportive education that will eliminate the achievement gap characteristic of urban underserved students and enable them to lead meaningful and productive lives both for themselves and for their community. We believe that all children regardless of race, ethnicity or economic status can succeed if they have access to a great education such as that provided at BCCS. And we are committed to serving all students from the Waterbury community who are enrolled at BCCS, including English Language Learners and those with special needs. In Connecticut, public charter schools receive $11,000 per student from the State, approximately 75 percent of the per-pupil funding allocated to traditional public schools. We are also not provided with public facilities. The costs to provide our education program, however, is only slightly less than that of our host district. To close this funding gap, we must raise the difference each year to cover operating and facilities costs. BCCS is a 501(c)(3) charitable organization. Your contributions are tax deductible to the extent permitted by law. Our EIN is 46-2366321. BCCS is on Guidestar and will participate in the Connecticut Community Foundation’s 2017 Give Local campaign. We have been extremely fortunate to receive the support of numerous individuals - in particular, members of our Board of Directors - as well as several foundations. 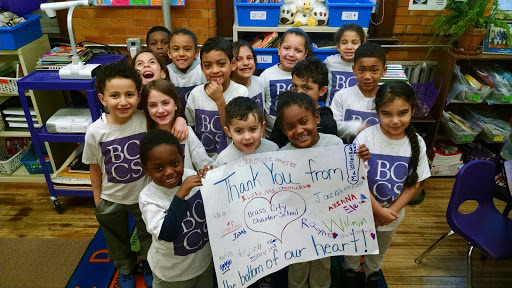 We ask you to help make BCCS the best educational experience in the area by supporting our work with your contribution. On behalf of everyone at BCCS, we thank you for your support. To make an online donation, please click here. You will be given the option to pay by PayPal or credit card. We provide Paypal as an option because it charges the lowest fee available (approximately 2%). Your transaction will show up on your credit card statement as either "BCCS" or "BRASSCITYCH". For donations of stock, please contact the office at (203) 527-5942. For inquiries regarding donations and development opportunities, please contact Barbara Ruggiero, Executive Director, at (203) 527-5942 ext 203 or bruggiero@brasscitycharter.org. You can also help the school by shopping at Amazon.com through the Amazon Smile portal (the link is below). A percentage of your purchase will be donated to BCCS.